of a 3D printed shell that is helping her heal. The leopard tortoise was rescued by Nico Novelll, owner of Canyon Critters Reptile Rescue.in Golden, Colorado. He believes that Cleopatra's diet was too high in protein. Now she is happily dining on such tasty tidbits as dandelions and cactus. While her diet was easily remedied, what to do about her shell was not so easily addressed The poor diet had led to "pyramiding" of her shell so that it was irregular and bumpy rather than smooth and mounded. It was a seriouo problem. If she were to get knocked over on her back she could not right herself again because of the shell's shape. In the company of other tortoises they play by climbing on one another. This is what caused a portion of her shell to get worn away. If her shell had been normal this would not have happened. This type of play also causes her shell to develop cracks which can lead to infection. Roger Henry, a student at Colorado Technical University, heard about Cleopatra and her troubles. 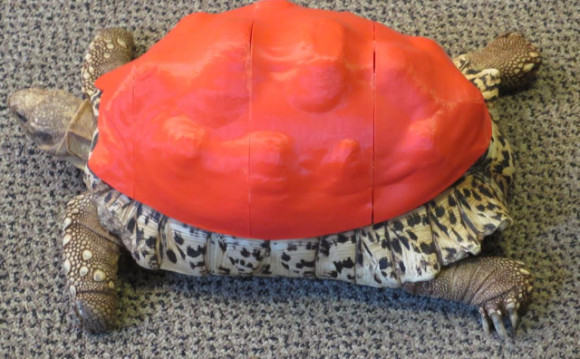 He spent hundreds of hours figuring out a way to come up with a 3D printed shell that she could wear over her existing shell to protect her around other tortoises. It attaches with Velcro. Since Cleopatra will at least double in size over her lifetime she will need to have several of these shells. It is hoped that with better nutrition and the help of the prosthetic shell that her shell will return to normal as she grows. Since she could live to be in her 80s she has a long time to get better. She won't need the plastic shell forever, just until things heal. People who adopt turtles and tortoises often don't learn what it takes to raise a healthy and happy reptile. If you are considering adopting, please educate yourself on how to take care of the specific kind of reptile you are adopting.